AMAZO has been unleashed on a poor unsuspecting and unprepared town. Will anyone arrive to save the day? Or will they just have to pick up the pieces like they did so long ago at Metropolis? Ra’s Al Ghul has formed an alliance with Gorilla Grodd and King Solovar. Their plan, to save the planet Earth from mankind. To do this, they have Professor Ivo build AMAZO…and his first test run is in an unsuspecting town in Arizona. It’s a peaceful nighttime as an unnamed child sleeps with his pet cat in Williams Arizona, the population is displayed as 3,023. The boy is awoken by what sounds like an explosion as the population drops to 2,947. Another explosion occurs when his parents arrive to check on him; population 1,254. He’s dragged from bed by his father, knocking his cat aside in the process, before being forced to leave the feline. The population dives from 1,254 to 704 and then 187. AMAZO crashes through the roof as the cat stands ready to defend its owners. The population is now at a measly 3. AMAZO scans the cat, the visual representation of his sight stating “no animals” before he moves it aside and incinerates the family. The cat looks at the skeletons as AMAZO leaves the decimated Arizona. Elsewhere, Brother Eye wakes a sleeping Bruce Wayne & Selina Kyle. She expresses some annoyance at being monitored without being told about it. However, Brother Eye apologizes and moves on with his initial message. He was set to monitor mass deaths and tells them about the incident at Arizona. But Brother Eye isn’t yet all seeing and didn’t catch AMAZO on tape. Only noting that there were mass deaths with no reports on what could’ve caused it. Bruce plans to investigate and Selina asks if he wants her to join. 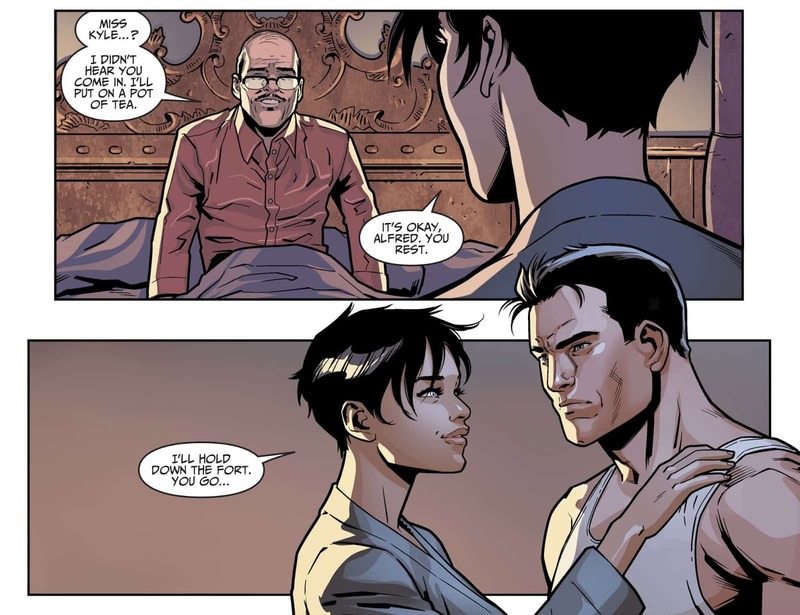 He declines the offer so she can stay and watch over Alfred. 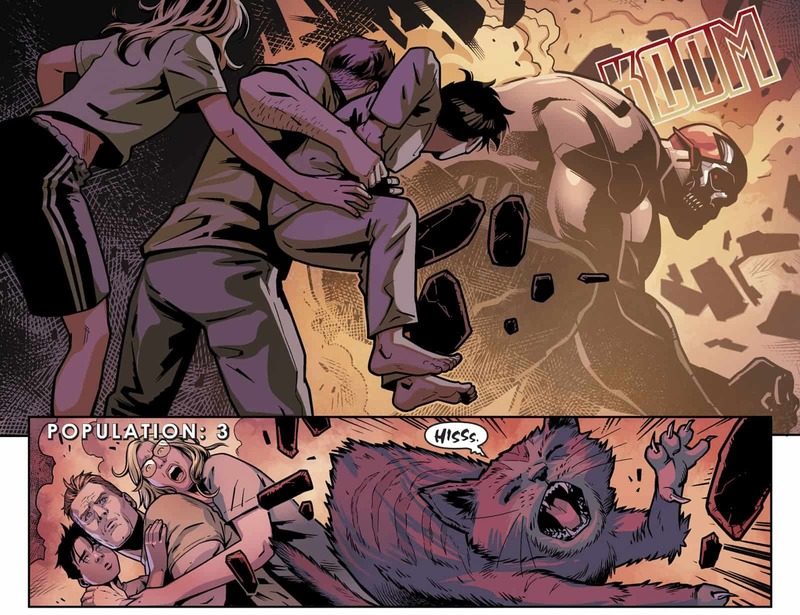 Back in the Injustice 1 comics, Alfred died at the hands of Zsasz in the Injustice 1 comics. Ra’s Al Ghul allowed Damien to bring him back to life using the Lazarus Pits, but he had yet to fully regain his faculties. Batman gets Batgirl and Plastic Man to join him in the investigation. Batgirl is understandably shocked at the sight upon their arrival. But now is the time for business and notes there is a considerable amount of burn marks and blunt-force trauma but only signs of the victims being present. Plastic Man, who went to search elsewhere, returns with a Puppy. When he brings up that the environment and animals were left unharmed they easily deduce this was Ra’s handiwork. Tragically, AMAZO left no traces of his presence and they have no idea what the goal was for attacking in the first place. 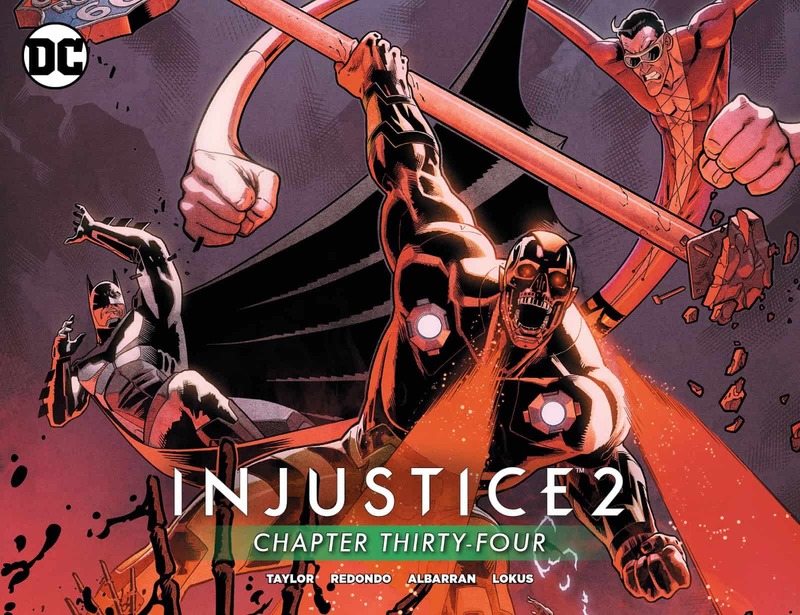 The scene shifts to Gorilla City where Ra’s explains to King Solovar and Dark Batman (They haven’t said his name since his first appearance at the beginning of the Injustice 2 comics so we’re just going to call him this). Ra’s claims he chose the town because it was isolated and an easy target for a hit-and-test run. Dark Batman questions the ethics behind this attack on innocents only to get called out for it by Solovar. The scene changes once more back to Batmans group when he says he’s seen enough to know they need all hands on deck. He’s not going to risk underestimating them. Plastic Man finds the cat, whose collar is now visible with the name “Dex” on it and offers to take it. Sadly, the puppy he’s holding at the same time begins barking at Dex and he lashes out at Plastic Mans hand. Batman calls to Plastic Man and begins to take off…a process which sends Dex flying from the knockback. The smoke clears when an all too familiar crimson ring floats down before the cat. The comic ends with a phrase many Green Lantern fans would know. Dex-Starr of Earth. You have much rage in you. Welcome to the Red Lantern Corps. AMAZO has finished his unholy rampage unopposed, the Bat-family have no idea he’s responsible, Dark Batman may begin his face turn, and now we have our very first appearance of a Red Lantern. There’s a bit of ground to cover so let’s go from the beginning. The way they showed the population bar decreasing with each panel was a really nice touch to show how quickly things were spiraling out of control. What’s more is in the last chapter it was morning and this it opens at nighttime…just how many people did AMAZO kill before this population counter started? Alternatively, if AMAZO wasn’t just decimating a town all day long then why did it take Brother Eye so long to find out? A minor gripe really but something I thought about. This chapter not only showed how deadly AMAZO is, but it continued the Ra’s arc and even sets up Dark Batman turning hero. Many fans speculate he’s really Jason Todd/Red Hood and if that is true this is the first steps to his reveal. 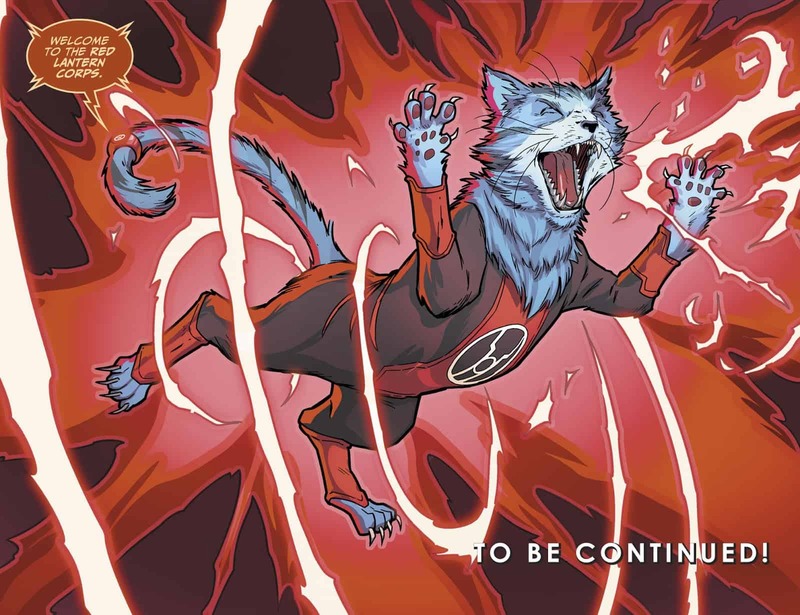 But we aren’t just getting a continuation of the Ra’s arc and now we have a potential Red Lantern one on the horizon. We know the Green Lantern Corps is still active but we have no word on the Sinestro Corps (outside of Sinestro’s imprisonment) or the rest of the Rainbow Brigade. After the war between the Green Lantern Corps & Sinestro Corps in Injustice 1, the Lanterns as a whole have been largely absent. But this spark of Red could signal the return or appearance of them all. Either way, things just got even messier. I’m a huge Green Lantern fan so having Dex-Starr appear was so cool. I didn’t even realize it was him until the ring appeared in the second to last page. I figured Injustice Dex-Starr had a similar backstory to the mainline DC comics but seeing his new backstory really pleased me. This also has me excited about the future. Some of the best parts, in my opinion, which may sound contradictory after saying I’m a huge GL fan, of the original Injustice comics involved the Green Lantern & Sinestro Corps. After the laughable handling of the Red Lanterns in the Injustice 2 story mode, I have high hopes for what the Atrocitus and his corps will do here.